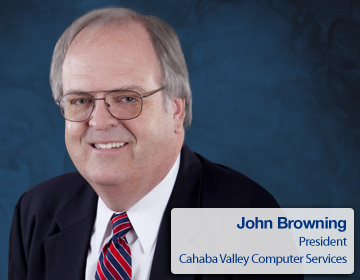 With service and support from Cahaba Valley Computer Services, it's like having your very own IT department for a fraction of the cost. Cahaba Valley Computer Services, LLC is committed to providing dependable computer support to growing businesses. With Network Services that are better mapped to your everyday business processes, you can finally focus on running your business. As experts in IT Consulting, we are dedicated to helping companies remove the frustration of technology to improve organizational processes and performance in Shelby County, Hoover, & Surrounding Area. Cahaba Valley Computer Services provides the Computer Support that can take the focus off of your technology, and put it back on your business. Serving Birmingham, Hoover, Tuscaloosa, Bessemer, Leeds and Jasper, our Computer Support can increase the productivity of your company. With customized Network Services and IT Consulting, you can experience the power of technology without the hassle of dealing with its tedious management and maintenance. As a trusted partner in technology, we are dedicated to bettering businesses like yours. We provide a range of Computer Support, Network Services and IT Consulting in Birmingham, Hoover, Tuscaloosa, Bessemer, Leeds, Jasper, Irondale, Fultondale, Gardendale, Hueytown, Vestavia Hills, Jefferson County and Shelby County. Very accomodating and always available to fix issues at hand. United States International Group, Inc.